If you ever wondered how it can be so easy to lift open or gently close even the heaviest garage door in Stamford, The answer is in the garage door mechanism, and of course the spring system, which is designed and build in a way that balance even the heaviest commercial overhead doors in Stamford, and make it easy to operate them. And for that matter, it doesn’t matter if your garage door in Stamford is equipped with extension spring system or with torsion spring system. There are many calculation which were made by the people who designed the garage door, so the right spring will move the door, keeping the gentle balance that keep the door up when you open it, and keep down when you close it. So if you own a garage door in Stamford, look at the door and you will see spring system (1-4 springs, but usually 2), and it will help you understand how your garage door is operating. Since the garage door springs are under a lot of tension, a snapped garage door spring is not a rare problem, and definitely not a problem that require to replace the whole door, you just need to find someone who repair garage door spring in Stamford, and who can replace garage door springs. We offer spring replacement in Stamford for all kinds of garages including commercial garage doors and residential garage doors spring system, since garage door spring repairs is part of our garage door repair services we offer in Stamford. Do not use a garage door which its spring snapped. Using such a door will lead to bigger damage and can be dangerous. Call us for a same day garage door spring repair in Stamford. 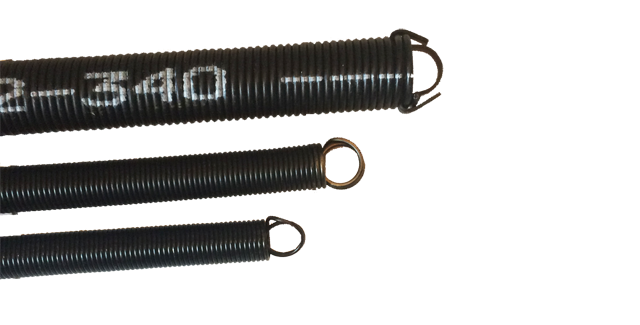 We carry springs for all kinds of garage doors in Stamford, and we can replace your garage door spring today. If you own an overhead door in Stamford, and you look at your garage door, and you find that the springs are installed on top of the tracks (Attached to pulleys and cables), it means that your garage door in Stamford is moving by extension spring system. When one of the extension springs snap, it can be dangerous, and can put people, the door itself, objects such as your car, and other people near the door at risk. So whenever there is a garage door in Stamford that work with extension spring system, we offer you to make sure that there are safety cables installed in your door, in case the spring will break. The safety cables may not prevent the spring from snapping, and it is not a hundred percent protection, but at the same time it may prevent a bigger damage in case one of the springs will snap. Every garage door in Stamford is unique, and not every spring will fit every garage door! So if you plan to do the replacement by yourself instead of using a professional garage door tech in Stamford, make sure you have the right spring, and that you know exactly what you are doing. Not once during servicing garage doors in Stamford, we found people who tried to fix their garage door by DIY, and ended with serious injuries and bigger damage. So when it comes to garage spring repair in Stamford, we recommend to use the services of a local garage door company who offer same day garage repair in Stamford. Although the safety have no part in operating your garage door in Stamford, and the garage door will work the same with or without them, it is important to install safety cables, to protect the area which surrounding your garage door if the spring will snap one day, and like every garage door in Stamford, one day the spring will eventually snap. If you need to replace the springs, make sure to use a trained technician in Stamford, and make sure that the installer will also include safety cables. If you own a garage door in Stamford, and you are not sure if there are safety cables included in your spring system, look at your springs and search for the safety cables. If you see a steel wire entering from one side of the spring, and exiting from the other side, it mean that you have them. If you do not see them (Do not confuse them with the necessary cables to operate the door, cables which actually connected to the spring and wrapped around the pulley).If there are no safety cables, you can install them by yourself, or you can contact Lifetime Overhead Doors and we will install them for you. If you own a garage door in Stamford which work with torsion spring system, and one (Or both springs in some cases) of them snapped, do not try and use the garage door since it can be dangerous. Think about a heavy door that suddenly lost the force that balance it, and that prevent it from crushing and break. A torsion garage door spring replacement – whether it is a garage door in Fairfield County Stamford or a torsion spring repair in Stamford - is not an easy project, and it should be performed by a trained garage technician, who can install the right spring for the door, and that will know how to replace the spring in a safe way. We offer same day garage door spring replacement in Stamford, and we carry with us torsion garage springs for most garage doors in Stamford. Please be careful! And do not attempt to try and replace a broken spring by yourself, and contact a garage doors company in Stamford to do the replacement for you. We know that there are many online tutorials which explain how to replace a torsion spring in a “do it yourself” way, and if you read more along this article you will learn why it is not recommended. So again, with our same day spring replacement in Stamford, there is no need to worry, since we can make your garage door in Stamford to work again today. Before we elaborate about the garage spring repair, we would like to make it clear that a broken garage door spring in Stamford can be dangerous, and it is best if you avoid operating the door until the broken spring will be replace, by a local garage door company in Stamford. There are few steps that included in a professional garage door spring replacement, they can be applied to all overhead garage doors whether it is a garage door repair in Connecticut or a garage door repairFairfield County. The first is of course to locate the right spring for your garage door in Stamford, and the second part is the spring installation itself. As we explained earlier, the garage door springs are under a lot of tension, and being near one when it break is not a pleasant experience that can be dangerous. We hear many stories from home owners who tell us how lucky they were that they weren’t inside the garage when the spring snapped (Especially when the case is extension spring). It may followed by a loud noise of the breaking spring, and it may make you wonder if your door is totally lost and they will now need to locate a garage door installer in Stamford. But do not worry, since repairing garage door spring in Stamford is what we do, and we like to think we do it the best. If you will search online for a garage door spring repair in Stamford or anywhere else, you will find a large collection of Videos, tutorials and articles that explain how to replace a garage door spring by yourself. And while watching the Videos, it may seem simple to replace the springs, just to locate a garage door supplier purchase the spring and replace the old one. But, and this is the important part: Every garage door IN Stamford is unique, in terms of the place where it is installed, and the way it is working (And of course the size and the weight of the door). And what may work for the garage door spring replacement you watched on the Video, will not necessarily work for your garage door in Stamford, and here is where the problem begin. Repairing a garage door in Stamford by DIY can be dangerous. If you are not sure that you purchased the right parts, if you don’t have the right tools for the job (Avoid using improvised tools), and if you don’t have the knowledge which garage door repair demand – In Connecticut, Connecticut or anywhere else in Stamford - please contact a garage door technician in Stamford to do the repair for you. Replacing a torsion spring for a garage door in CT is not a simple job, and it require certain knowledge about the garage doors in Stamford, and that knowledge can turn the repair into something dangerous and sometime impossible. So if you are not sure, use the services of a local garage technician in Stamford. If you think that you can perform the spring replacement by yourself and not using the services of a professional technician in Stamford, make sure that you have the right spring for the door (There is only one “right” size of spring), that you have the right tools (Do not replace the required torsion sticks with a different tool it can lead to injuries), and that you got all the knowledge which require to replace a broken spring for a garage door in Stamford. Make sure you have the right tools to fix a garage door in Stamford. Make sure you have the right parts that fit a garage door in Stamford. Contact a garage door specialist in Stamford for any questions. Most commercial overhead doors in Stamford use custom made springs. 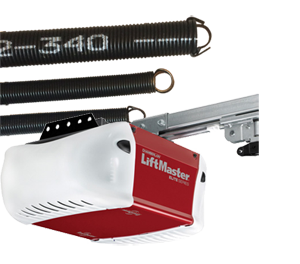 There are many different commercial or industrial overhead doors in Stamford and in order to replace their spring (Usually torsion spring) require tools for the job, locating the right spring for the door, and locating a garage door supplier in Stamford who carry the needed springs. Commercial overhead garage door in Stamford can weigh hundreds of pounds, and can easily lead to serious injuries in case someone who isn’t professional enough try to fix it. So do not try and force the garage door to work, or push it back into tracks, since it probably won’t solve the problem. And with our same day garage door repair service in Stamford, we can fix it for you today. Every garage door in Stamford need to be maintained every few months. It doesn’t matter if it is a garage door in Stamford, or a garage door service in Greenwich, or a residential garage door in Stamford, maintain a garage door in Stamford will make sure that the door will continue to work, and protect the parts of the door like the spring system and other moving parts. If your garage door spring snapped, and you are reading this article, maintenance will not help. You need a garage door repair service in Stamford, and only then you should perform the maintenance. Garage door maintenance cannot replace repair. If you need garage door spring replacement in Stamford, contact us for a same day service. By the end of the repair, we will perform the maintenance, like we do for every garage door we service in Stamford, whether in Connecticut, garage door repair in Fairfield County CT, or a garage door in Connecticut Stamford. Where to but garage door spring in Stamford? We do sell garage door parts in Stamford, but we do not sell all parts. Not because we do not have the parts, but because a garage door repair can be dangerous. We will not supply parts for commercial heavy duty garage door in Stamford for you to replace it by yourself. Rep[lacing a torsion spring for a commercial garage door can be dangerous, and we prefer not to supply you with the part, and to avoid injuries or damages that can occur when the part is used by someone who isn’t trained to deal with commercial overhead door in Stamford. If you are wondering “ where to but garage door parts in Stamford ”? You can always call us and ask us. We do sell parts, but only parts that replacing them by DIY will not put you at risk, and that relatively easy to install. So if you are looking for extension spring in Stamford, torsion spring, garage door opener, cables pulleys and such, we are the answer for all your garage door needs in Stamford.